Sadly the other week the awesome VolcanoCafe sight came under attack by an old member of the admin and was decimated. Luckily for all of us avid readers it can now be found on http://www.volcanocafe.org Now it is back up and runnin Carl and Henrick have managed to throw up an unexpectid number 7 for their new decade volcano list. Introducing Mount Cameroon……. Few volcanoes on the planet represent such an awesome sight as the majestic Mount Cameroon. 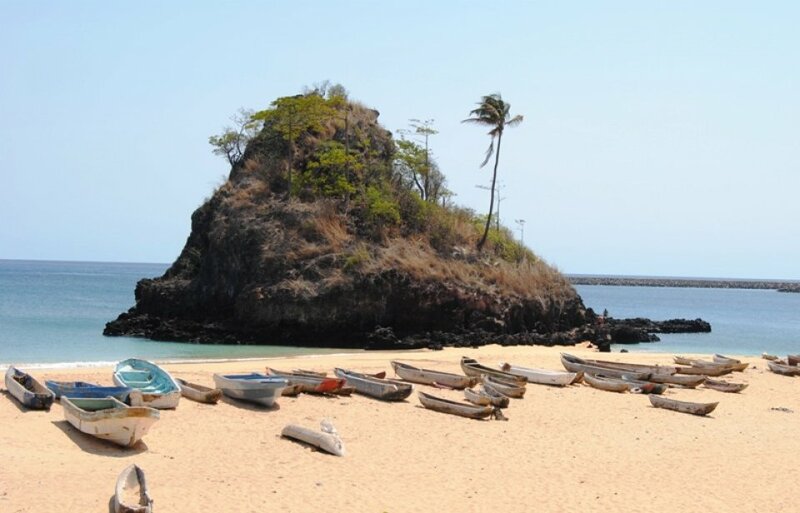 It stretches from the edge of the Atlantic at Bakingili Beach and reaches an astounding height of 4040 meters. Due to its prominence it is regularly dusted with snow at the top. Mount Cameroon, or as I am used to calling it, Mount Fako, is the only volcano to date that I have worked professionally with as a geophysicist. As volcanoes go it is somewhat of a “terra incognita”, and to be quite frank, most that has been written about the volcano is just not correct. So, there is an ample chance here to set a few things straight, do some real science, and also put the limelight on one of those volcanoes of the world that is both highly dangerous and completely unmonitored. To understand Mount Fako we first must start with the geologic setting, and also come to terms with the geologic timescale of West African Volcanism. There are 3 distinct geological features that we need to contend with as we speak about Mount Fako. 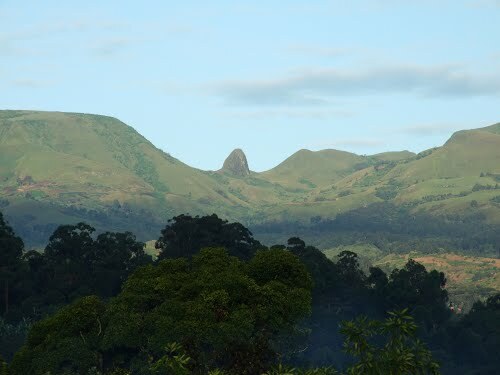 The first one is the Cameroon Volcanic Line, it consists of 4 volcanic Islands, 2 large seamounts, Mount Fako itself, Manengouba, Bambouto, The Western Highland with Mount Oku, Ngaoundere, Mandara and Biu. Volcanism in the Cameroon Volcanic Line spans a time period of 49 million years and contains two distinct periods. The first period consists of magmatic domes and maars, most of them are heavily eroded today and requires specialized knowledge to find. This period ended about 33 million years ago and can be seen as a proto-volcanic phase. The second period started 32 million years ago at Mandara and Mount Oku. The ensuing volcanism is highly programmatic and follows a pattern where the volcanoes are born through large scale basalt eruptions creating layers between 50 and 600 meters thick. After that comes a period of trachytic lava with minor rhyolitic ignimbrites, after that comes a large caldera event with subsequent dyke formations and phreatomagmatic eruptions of diminutive scale. The eruptive phases of the volcanoes spans from millions of years to tens of millions of years. There is no good explanation to why the basaltic eruptions during a fairly short time switch to highly explosive volcanism. My suggestions is that the large basalt flows necessitate large volume magma reservoirs that over time fills with residue from earlier eruptions and also that the magma reservoirs becomes inundated with stale base rock low in volatiles. 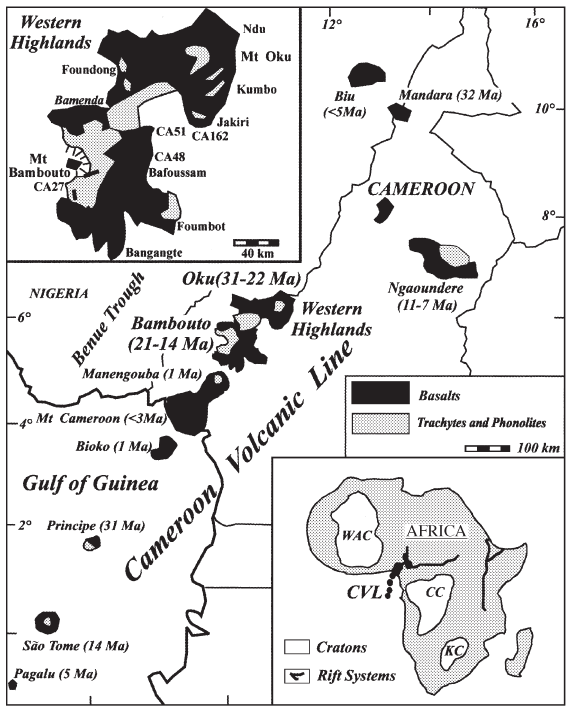 The formation of Cameroon Volcanic Line has erroneously been attributed to a hotspot or mantleplume. And to the naked eye there seems to be a telltale track of volcanic islands and volcanoes. There is just a problem, there is definitely no hotspot or mantleplume to be had. I will though get back to this later on. Let us start at the Northeast and work our way down to Mount Fako. 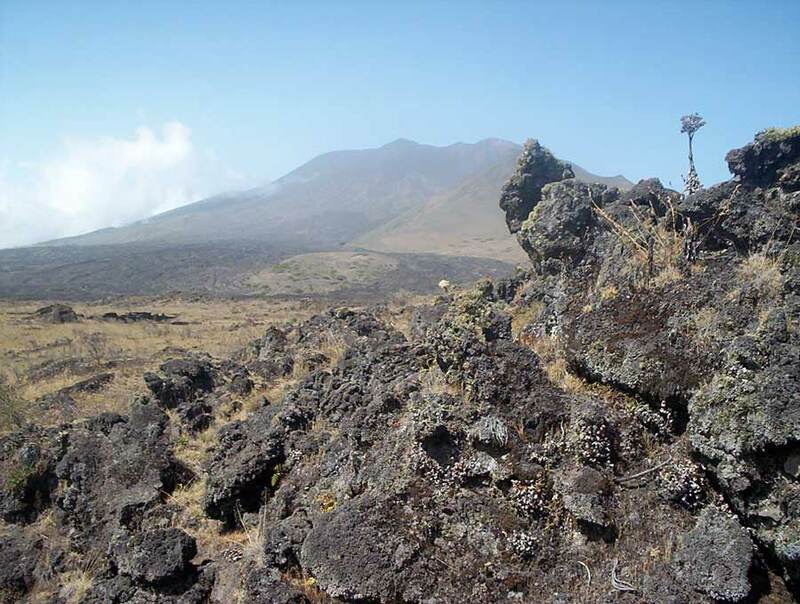 The first volcano we stumble upon is Biu, very little is known about the volcano except that it morphologically follows the normal composition for a CVL volcano and that is started its activity less than five million years ago. To the southeast comes the 32 million year old volcano of Mandara with an unstudied volcano due south. Further southeast of that unstudied volcano is the massive caldera of Nagoundere. The group above is a distinct group of its own, not due to being morphologically different; instead they sit on a different rift system than the rest of the volcanoes. 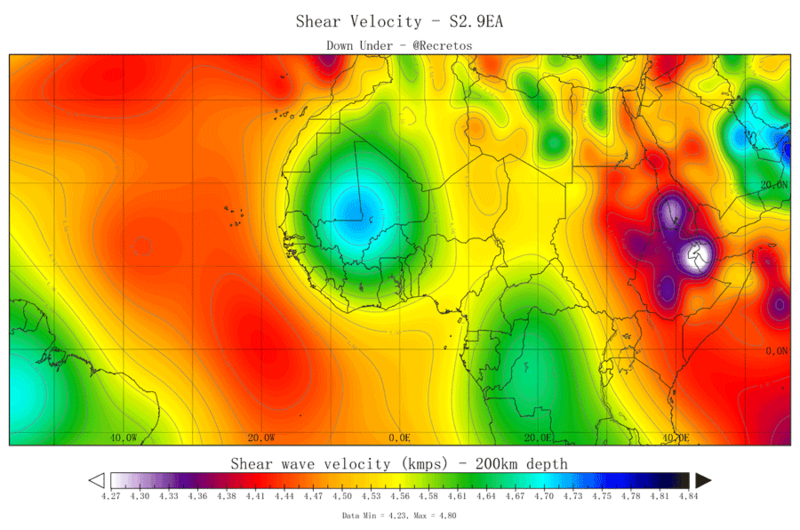 This rift system is roughly horseshoe shaped and transects the Central African Shear Zone that is home to the volcanoes below. Now it is time to continue with the Western Highlands that consists of two main volcanoes. 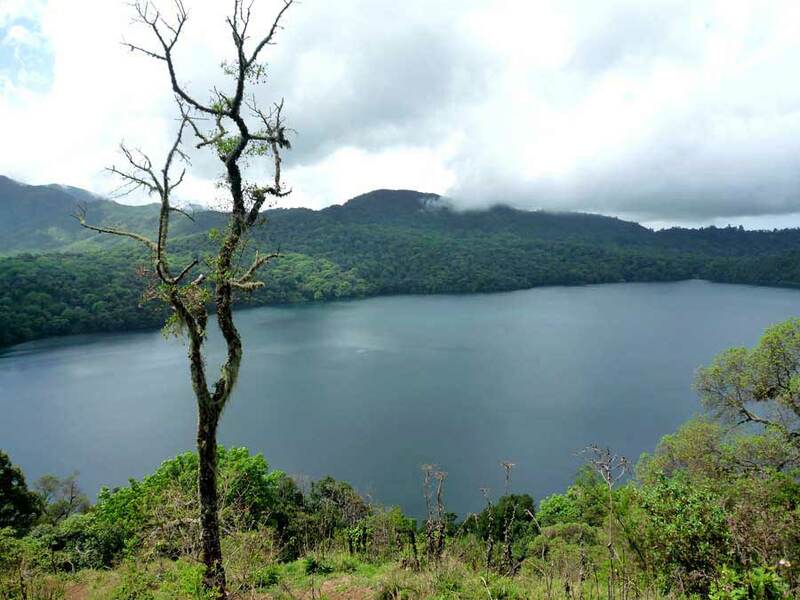 The northernmost of those is Mount Oku that was active 31 to 22 million years ago before it went caldera forming Lake Oku. Southwest of Mount Oku we find the massive caldera of Bambouto that was active between 21 and 14 million years ago. 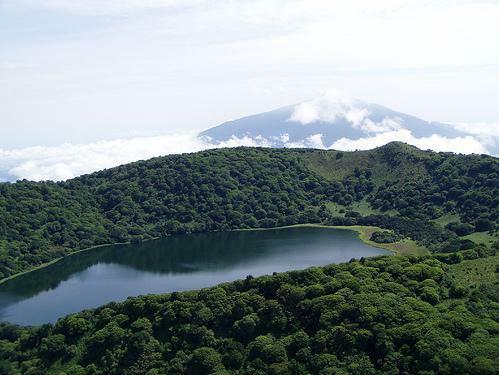 Next in line is the 1 million year old active volcano of Manengouba that is situated northeast of Mount Fako. It is a part of the Fako volcanic zone but is a younger and distinctly separate volcano. What makes Manengouba so interesting is that it took less than 1 million years before it went caldera. If we for now skip Mount Fako itself and jump to the other end of the CVL we find the miniscule volcanic island of Annobón and its volcano Pagalu. This diminutive Island formed during an unusually short volcanic period that started 5 million years ago and lasted less than 1 million years. Next in line is Sao Tomé that is one large shield volcano. It started to form 13 million years ago and the volcano is still believed to be active due to the young cinder cones situated on the southeast side of the island. It is also well known for the Pico Cão Grande volcanic monolith. To the northeast of Sao Tomé we find the island of Principe that erupted from 31 million years ago to 14.7 million years ago. 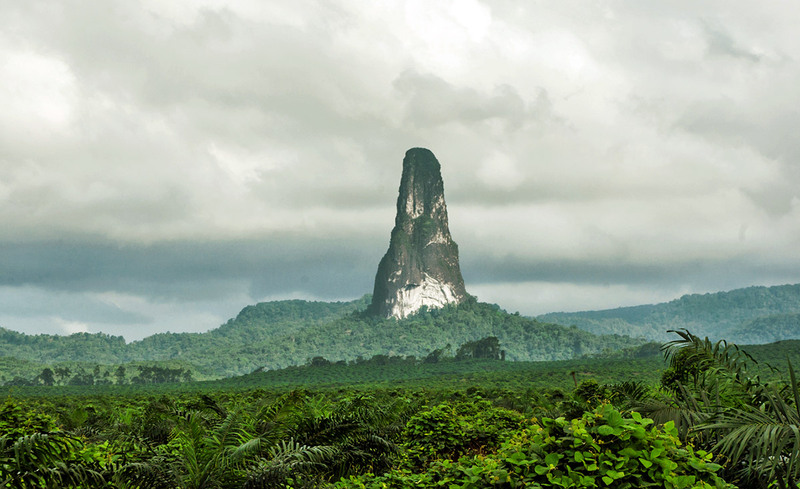 The next island is Bioko that is housing no less than 3 major shield volcanoes that have been active historically. Volcanism here started 1 million years ago and eruptions occurred last in the 19th century. All of the volcanoes from Pagalu up to that peskily unstudied volcano is situated on the CASZ, through that unstudied volcano runs the previously mentioned horseshoe shaped fault zone. The CASZ formed around 640 million years ago and was volcanically active around that period. Previously western scientists believed that the CASZ was tectonically inactive until an M5 earthquake occurred and was monitored on a temporary seismometer. Local sources have though always stated that large earthquakes happen frequently along the shear zone, especially during eruptive phases where houses commonly have been leveled by the intense seismic activity. The CASZ was volcanically active both 640 million years ago and also 130 million years ago during the break up of Pangea. One should note that the 3 active periods do not rule out smaller scale volcanism in between. As such the CASZ is the oldest volcanic feature on the planet that is still active. The CASZ used to continue in the form of the Pernambuco Fault in Brazil, but as some people have noticed, the breakup of Pangea occurred and the Shear Zone ended up divided across two continents by a sizeable ocean. 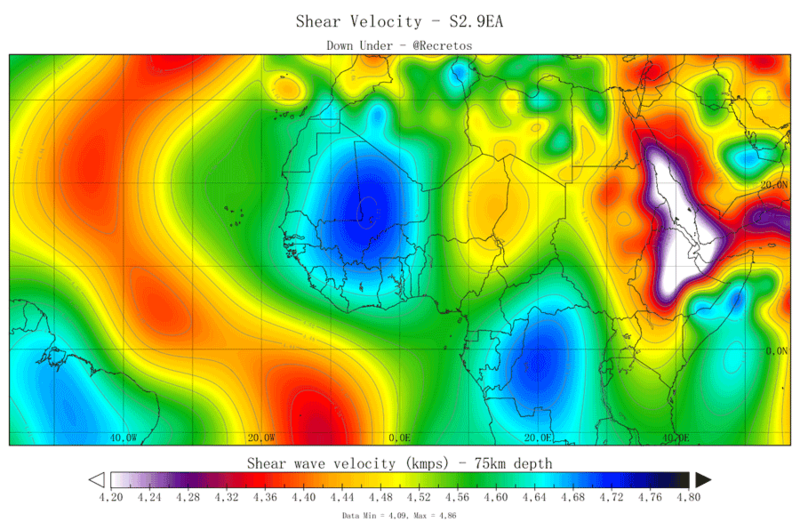 At the same time as the single largest eruptive episode started at Paraná-Etendeka with both trap formations and the largest explosive eruptions on record the West African Craton and the Congo Craton started to separate at what is today the Benue Through. Volcanism at Benue Through started prior to the Paraná-Etendeka event at 149 million years ago and continued for roughly 100 million years. As the breakup of Pangea was completed the Benue Through separation of Cratons reversed and the Through started to close up, that created a heavily folded zone adjacent to the CASZ. I would seriously try to remember this feature in your mind as I get back to the hotspot and mantleplume issue. The reigning theory for the volcanism on the Cameroon Volcanic Line is that it is created by a hotspot that is travelling in an ENE direction. Only problem is that the time record does not support this at all. To be quite frank, the pattern of age of the volcanic centers is entirely random. Let us repeat the ages from north to south. 5, 32, unknown, 11, 31, 21, 1, 3, 1, 31, 14 and 5. Either I have grown dimwitted or there is just not any time sequence that is associated with a hotspot track 1 600 kilometers long. Some have tried to save this by surmising that there is another hotspot there and they also favor to put in influence from the Saint Helena Hotspot in the mix. It still does not blend very well with reality. So, if the time does not indicate a hotspot, what does? Well, the temperature of the erupted magmas is quite enigmatic. The volcanoes have erupted varied temperature magmas with the heat record at 1 338C and the coldest at 1 106C with a medium temperature of 1 280. That would put it at 220C below the temperature of the Hawai’i hotspot and en par with the Icelandic Hotspot. As such that would be a fairly cold hotspot, but those exist as we know from Iceland. Only problem is that the hotspots of Iceland, Hawai’i and the African Plume are caused by upwelling from deep within earth and all 3 of those are clearly visible when you create tomographic charts of the mantle. 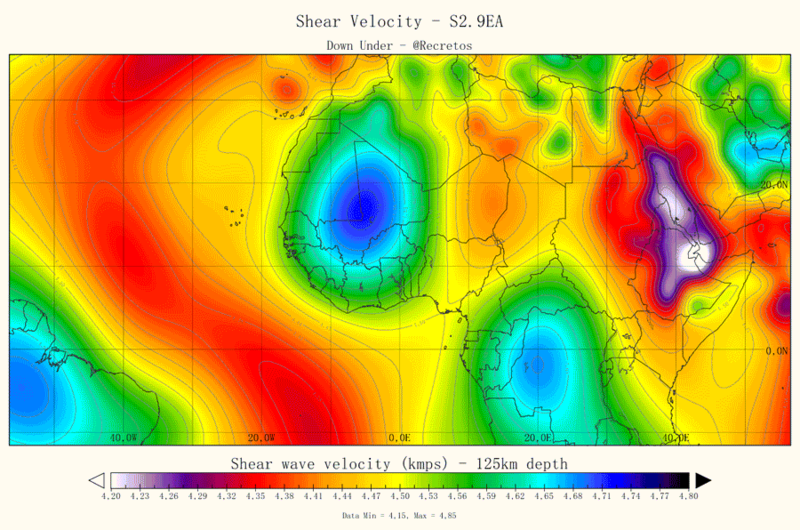 A tomographic chart shows anomalies in the speed at which sound travels after an earthquake. The most clearly visible such entities are the Icelandic Hotspot and plume upwelling and the African Plume residing under Eastern Africa. Those can be seen very deep indeed. Problem is just that if we go and look at the CVL we see nothing as such, actually we even find inverse anomalies at depth showing the area to be slightly cooler than expected. 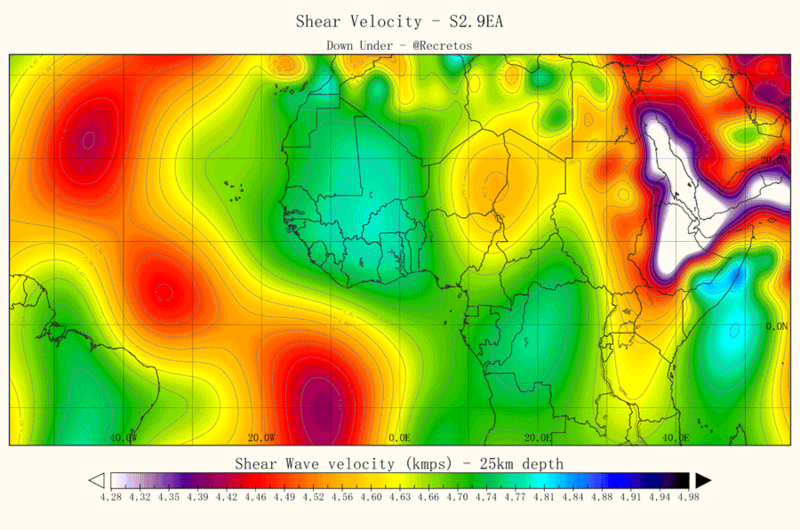 The next theory is that the Benue Through is causing a localized upwelling of material from below the LAB (Lithosphere-Asthenosphere Boundary). 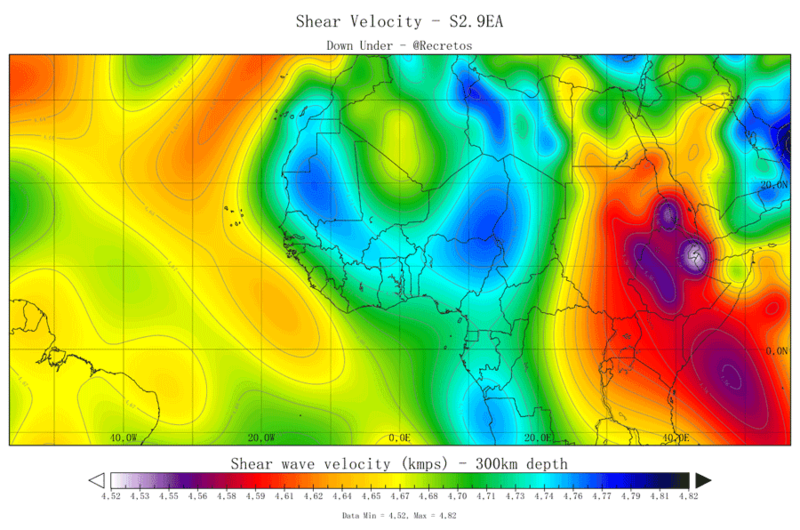 Only problem is that this is not evident from the tomographic maps either. This leaves us with a conundrum. We only know that there is no hotspot causing the volcanism. We also know that the volcanism is extremely extended in time. Volcanism is caused either by hotspots, spreading rifts like the MAR or subduction caused melt. We know that for about 50 million years there was spreading rift volcanism going on adjacent to the CVL at the Benue Through, we also know that this started after the CASZ volcanism. We also know that there historically has been no subduction going on there. Sooner or later subduction in the area will start, but we are not there quite yet geologically speaking. We are here left with a 640 million year old riddle regarding volcanism. Either we are missing something, or we have a fourth form of volcanism going on at the CVL. Sadly the CVL and Mount Fako is highly understudied. This is the first reason that Mount Fako should be on the new Decade Volcano Program. Even though it is sited as being a stratovolcano Mount Fako is actually a fissure row of volcanic craters. In some respects it reminds of an effusive cousin of Iceland’s Hekla volcano in shape. Eruptions at the volcanic fissure line started 3 million years ago with large scale basalt flows that built up an elongated shield. As volcanism continued with shorter lava flows the sides have grown increasingly steeper until a steep sided elongated hull like shape formed. As volcanism progressed the lava flows has grown increasingly volatile rich and eruptions often take place at 2 or more places. One of the sites will be high up on the volcano and will be explosive in nature and further down the fissure there will be an entirely effusive eruption causing lava flows that often reach down to the Atlantic Ocean. The eruptions span between VEI-2 and VEI-4 with VEI-2 sized eruptions being the by far most common type. During eruptions the volcano becomes highly seismic with extensive and intense earthquake activity that often affects the capital of the Southwest Region Buea heavily with raised houses and deaths occurring. Normally residents of Buea are forced to sleep outdoors during eruptions to not risk that their houses cave in on them. The lavas erupted are bimodal with basalts as the main component, but the other component are trachytes and phonolites signifying a volcano containing more evolved lavas in an intermediary stage. The sheer size of the 1 400 cubic kilometer volcano, the unstable flanks and the evolving magmas, point to a volcano nearing its end stage. If we compare Mount Fako to its post caldera brethren to the northeast we can see that they reached about the same size before they went caldera. The volcano does though not yet hold evolved enough magmas to form ignimbrite flows. The main forms of hazard are through seismicity and flank collapses. For flank collapses the cities of Buea and Limbé are in the strike distance. 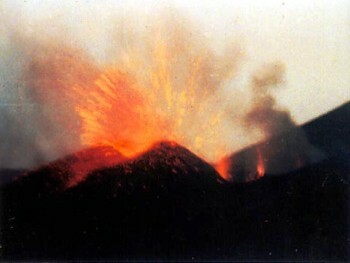 The gravest danger of this volcano is though not through an explosive eruption. Instead the gravest risk is that a large basalt flood event will occur like the one that was potentially witnessed by Hanno the Navigator 450 BC. Another large effusive eruption would not kill people directly, instead gas content and destruction of cities and farms would cause the death toll. Mount Fako is today not monitored at all. There is no active Seismometer, no GPS, no Inclinometer. Instead the park rangers are tasked with observing what is going on visually and forward the information to anyone interested in knowing it. Together with the risk to the large local population and the scientific conundrum that Mount Fako poses it clearly merits to be placed at place number 7 on our proposed new Decade Volcano Program.